I can not find SYSTEM 31 shape. Is it discontinued and why? I doubt it has been discontinued. This is more of a pipe-box brochure chart than a complete shape chart. However, I will make inquiries! Interesting that they chose to omit the 31 on the system list. As a lover of both Peterson pipes and straight billiards I would have loved to see that included on the list. I’ll talk to Peterson about it and get back to you. Jim, I heard from Peterson yesterday that, alas, the 31 has indeed been discontinued. There is an amazing apple straight System on eBay today. These were only made for a limited time in the 1950s and again (I think) in the late 70s. Check it out! Thank you, Jorgen, for your help in getting all the bugs worked out of the site today! 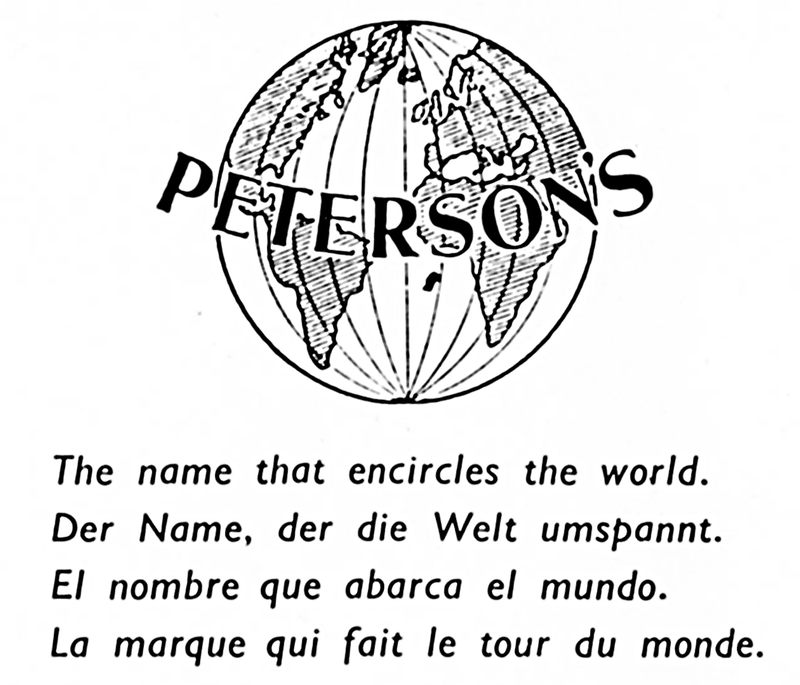 I am enjoying your Peterson Pipe website. I have a Peterson Kapet, #220 system pipe that I purchased in 1971-72. It does not have the metal band. Are you familiar with this model? Hi Joe, Glad you like it! The Kapet is one of Peterson’s first named lines, dating from about 1925. Your shape 220 was not a System, although if it has a reservoir and P-Lip, will function just like one apart from the metal ferrule. The 220 is the Classic Lines equivalent number for Patent shape 11, the 11S in the DeLuxe System and the 312 in the Premier and Standard. The shape is an original Charles Peterson design, seen in the 1896 catalog. Thank you for your kind response Mark. Yes, the 220 I have does have the reservoir and the P-Lip and without the metal band. The stem is more vertical with closer to a 90 degree angle to the P-Lip. Nice to hold in mouth as well as hand hold. 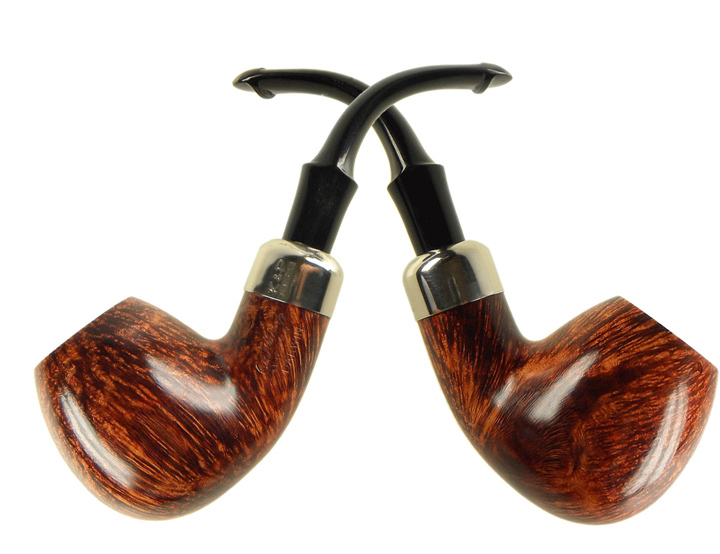 I’m currently looking for a new Peterson with the same basic stem geometry. It does not need to be a system pipe however, since I have 3 system pipes. I simply want to try something different and possibly a fishtail stem and perhaps an acrylic stem. Well, sir, there are certainly plenty to choose from, and i wish you luck. Sounds like you’re in the market for one of the army-mount lines. I’ll be posting a number of possibilities on Monday, with some fantastic places to go hunting. Good luck! How about a Kinsale, Smooth, XL-12, P-Lip with the Rhodesian bowl? Well, that’s what I ordered and hopefully it is as nice as picture illustrates it. It appears to have the same stem, mouthpiece geometry of my Kapet. You’ll love this shape. It’s an effortless clench, great bowl geometry. Very light between the teeth. Good job! Yes…the Sherlock Holmes version of this is a real looker as well ! The Kinsale, P-Lip, XL-12, Smooth arrived today. The first bowl was easy, mild and smooth. This has the system reservoir as well. The wood and overall fit and finish is beautiful. Mouth piece section is a bit shorter than expected but of no concern. Awesome! I’m surprised by the System reservoir, but with that P-Lip, it’ll function really well. Enjoy!